Rebecca Roth, who is a 36 year old suffering of brain cancer, has admitted that she uses cannabis oil and that she feels a whole lot better. "I am surviving at 23 months past my surgery. I do use cannabis oil. I have had no active cancer at all now. It's definitely a blessing for me." Roth, was only one of the many citizens from Towanda, who joined the rally in favor of medical marijuana this Saturday. Sen. Mike Folmer and Rep. Mike Regan, were also at this rally and they are also in favor of legalizing or regulating cannabis. According to some of the people at this rally, it is very likely that a bill will be passed for regulating medical cannabis in Pennsylvania very soon and this is excellent news for all of us. Commissioner Janet Lewis, was also at the rally and she said, "I think medical marijuana should be legalized. I have heard too many cases where it has helped people. 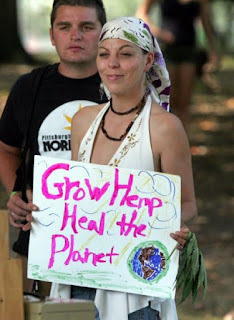 I think that the Legislature is afraid of the Stigma, They visualize hippies smoking pot. The Legislature should look beyond the Stigma and do research. There are people who are actually being helped by medical marijuana." The rally was planned and organized by local Towanda people and this is proof that more of us are in favor or regulating medical marijuana and cannabis for recreational purposes. Hopefully the lawmakers start changing their minds soon and finally realize that marijuana needs to be regulated and not prohibited anymore. Please remember to share and like this blog post, to help out the people from Towanda and people like Rebecca Roth, who are being benefited by medical cannabis every day.